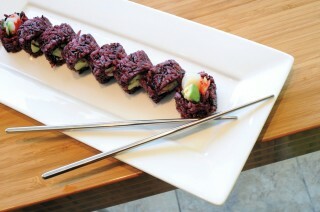 The Cinderella roll is made with black rice for a unique — and healthy — twist. Photography by Gordon King. 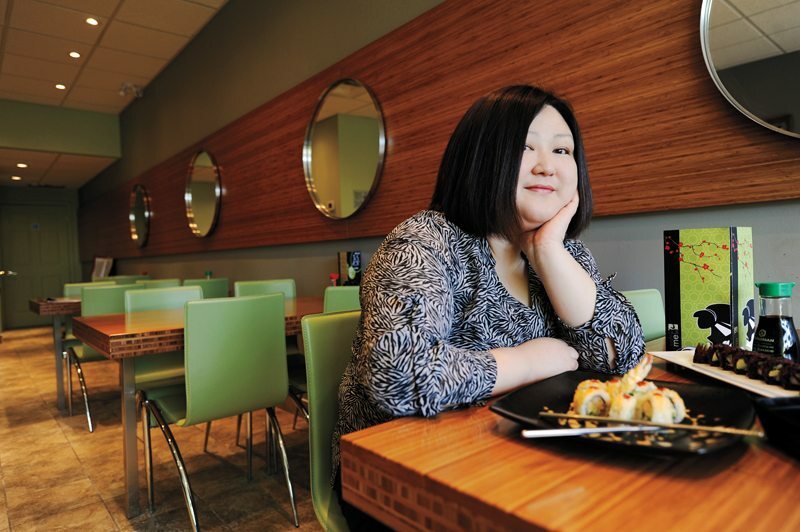 With Sushime, owner/chef Sue Jung turns a rice roll into a verb and a command — and her neighbours in the Beechwood area love her for it already. Since the doors first opened in December, a steadily increasing stream of diners is checking in for both the food and the atmosphere of this friendly, contemporary sushi restaurant. “In Korea, where I grew up, you wrap anything good up into a rice roll and eat it,” Jung says. Which explains the presence on the menu of both orthodox hosomaki and sashimi, as well as more whimsical offerings. The mermaid roll, for example, has a shrimp for a tail and avocado scales, while the Cinderella roll is made with black rice for a unique — and healthy — twist. For those few who aren’t smitten with seafood, there are meat and veggie dishes inspired by Japanese and Korean recipes. What you won’t find at Sushime are the super-long menus found at serious sushi restaurants or the all-you-can-eat sushi buffet at “sushi lite” establishments. Jung’s goal is to offer Ottawans a middle ground — “So far, so good,” she says with a grin. Raw ambition: Owner/chef Sue Jung offers up both Korean- and Japanese-inspired treats. Photography by Gordon King. Jung, who arrived in Ottawa 14 years ago to learn English, has the restaurant business in her blood. She grew up helping her mother in the family restaurant in Asan, Korea. Her culinary training includes formal education at the Cordon Bleu in Ottawa and on-the-job experience as a sushi chef at Takara and pastry chef in an Italian-inspired café. She has previously owned two other restaurants, Maru Sushi on Rideau and My Choice Café on Bank Street, both of which she sold. Sushime, however, is the first restaurant that is Jung’s creation from “floor tile to ceiling tile.”The decor is bright and modern with bamboo tables and bar and bamboo-leaf-green walls punctuated by porthole-shaped mirrors. The cheerful atmosphere and menu do more than embody a verb; they express a lifestyle — one that embraces simplicity, creativity, and good eating. Jung is waiting for a liquor licence. In the meantime, enjoy the green tea with roasted brown rice. Sushime, 8B Beechwood Ave., 613-741-4777. The Spotlight on Sushime was featured in the April 2012 edition. See more photographs in the print edition.